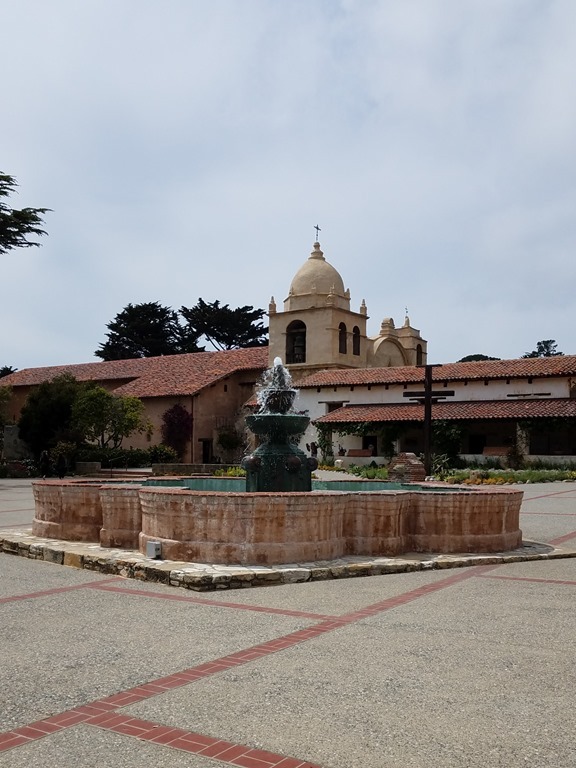 Saturday- We stayed in Salinas today. Our first stop was at Walmart to drop off Bob’s prescription. We looked at Costco for gas, but they did not have a gas station. Too bad, with the price of gas being so high! 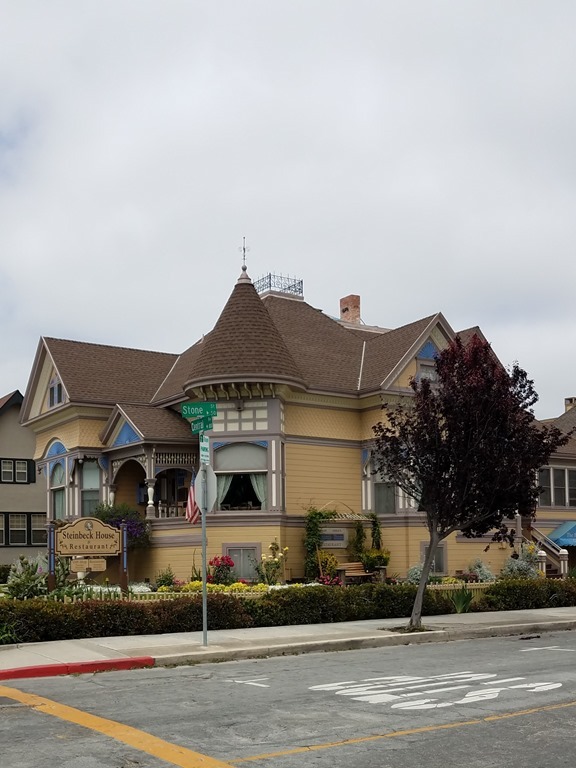 We went to Old Town Salinas. We were headed to the Steinbeck Center, but spotted a Farmers Market. Usually we find the markets listed on the internet, but we could not find one listed in Salinas. We parked in a 2 hour parking space for free and walked back about 2 blocks to the market. They had all the usual stuff, but we only purchased romaine lettuce. We returned to the car and dropped off the lettuce. 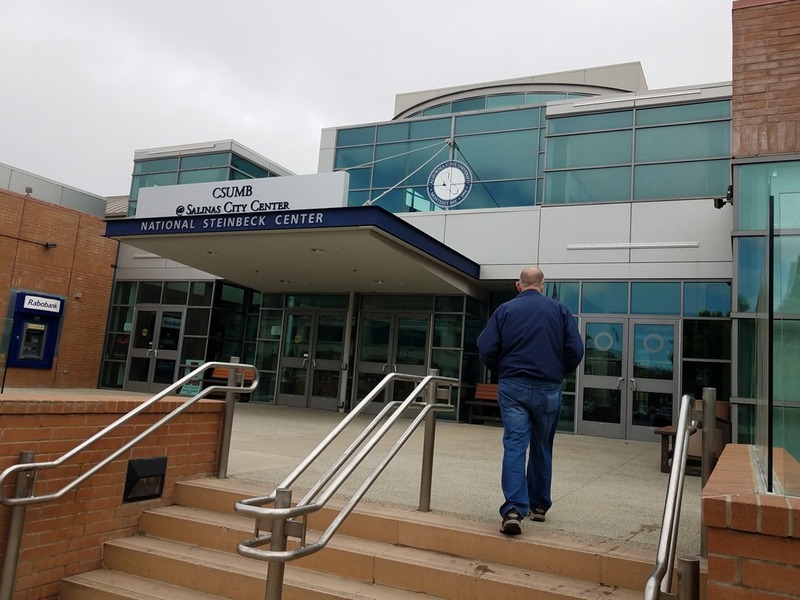 We walked over to the Steinbeck Center. 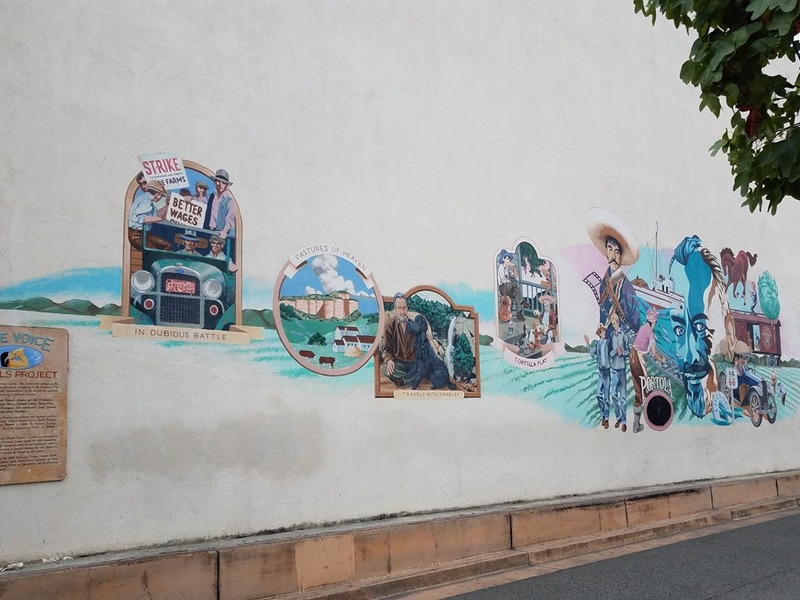 Right across the street was this mural of the history of Salinas. We paid the $9 each, senior rate, and entered the museum. 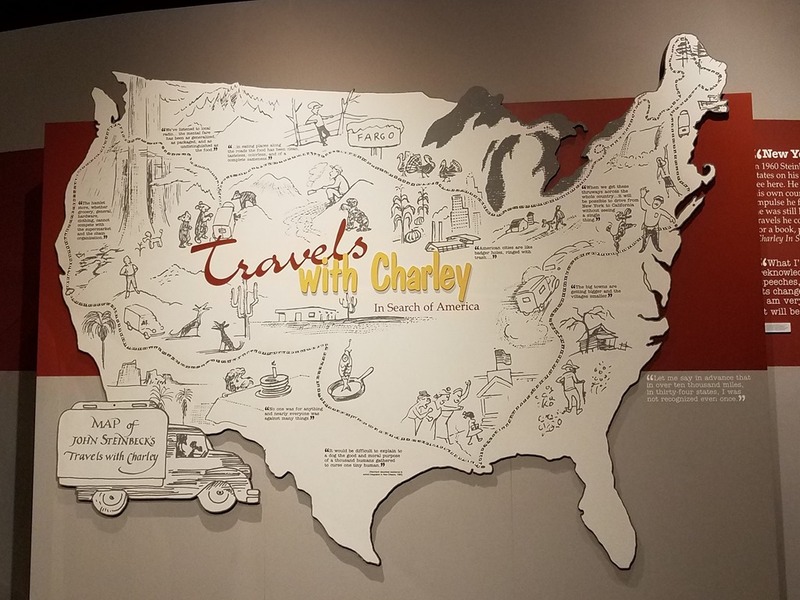 The museum combines history with his writing, and of course, there was a lot about the Salinas Valley. 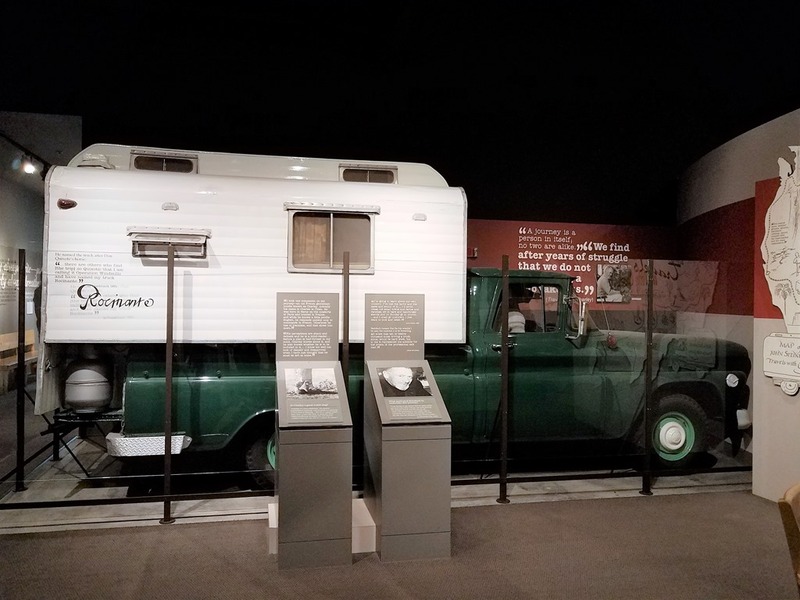 This was the RV that Steinbeck and Charlie ( his poodle) traveled in. I think my father had gotten the idea for his first camper from this, as Dad’s looked very similar. 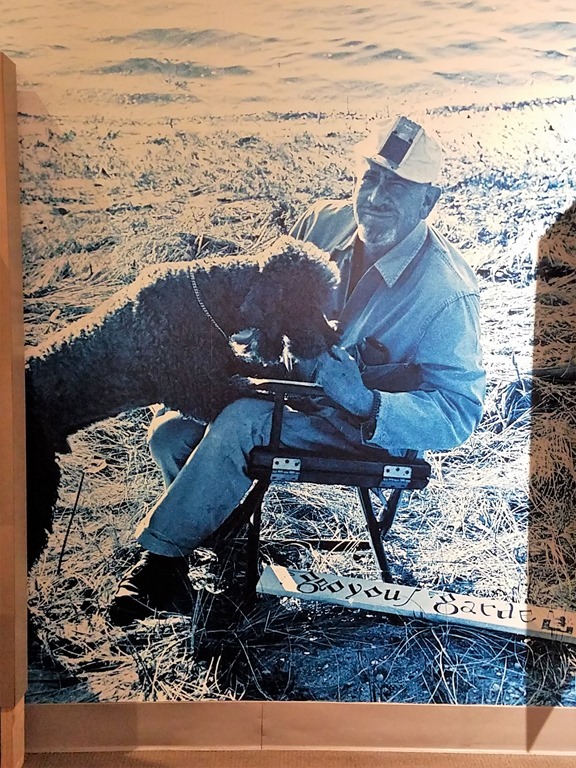 Steinbeck was also a WWII news correspondent. They had some of his articles highlighted. My favorite was about ‘the girls”. In the article, the men were men, but the women were girls. But, the theme of the article was about how the women worked so hard and saved so many lives during the war. Okay, I will forgive him for calling them ‘girls’. It was the time period…. We watched the video about his life. He was married 3 times and had two sons. Both sons have passed also. His widow was featured in the video although I am not sure if she is still alive. He grew up in the Salinas Valley. The Grapes of Wrath is about the Salinas Valley. 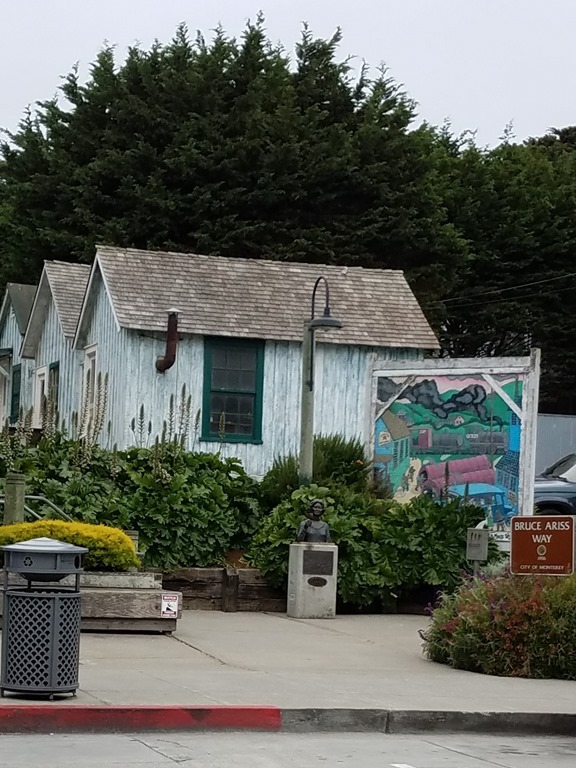 Cannery Row is about Monterey. I read the Grapes of Wrath in high school and remember that I hated it because it was so sad… Below is the downtown from the front of the museum. We left and went two blocks down the street to his childhood home. 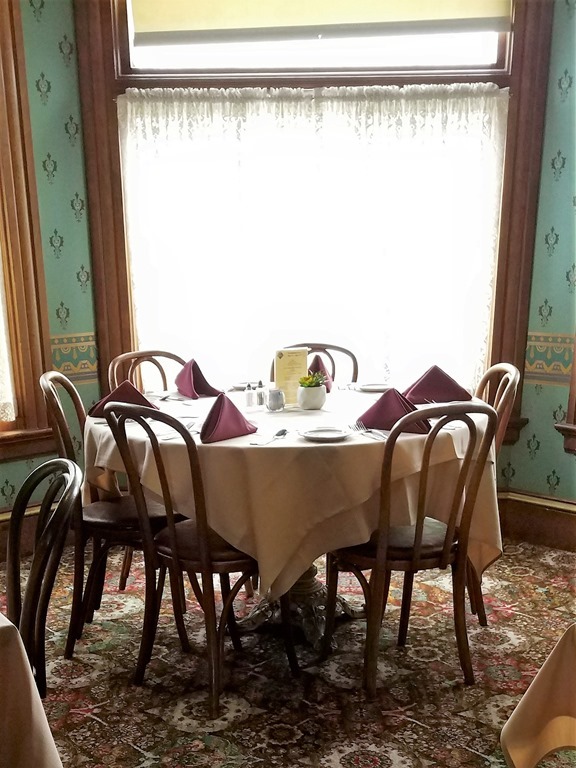 The home is a restaurant and you are only allowed on the first floor and in the basement gift shop. We decided to eat lunch there. I had the crepe ( it was more like an enchilada). Bob had the Ruben. The food was very good. All the money goes to the upkeep of the home. This was his postage stamp. After the family sold the house, several other families owned it. 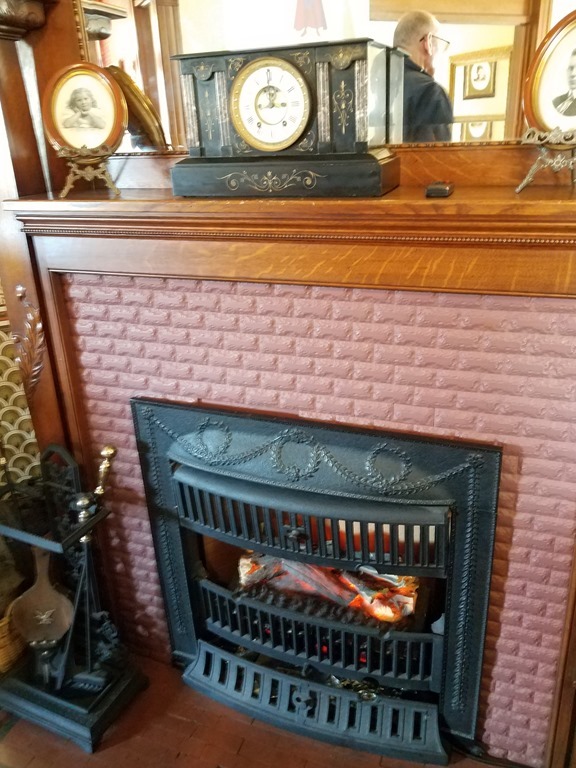 When it was purchased by the Not-for-profit, they found this fireplace grate in the basement. 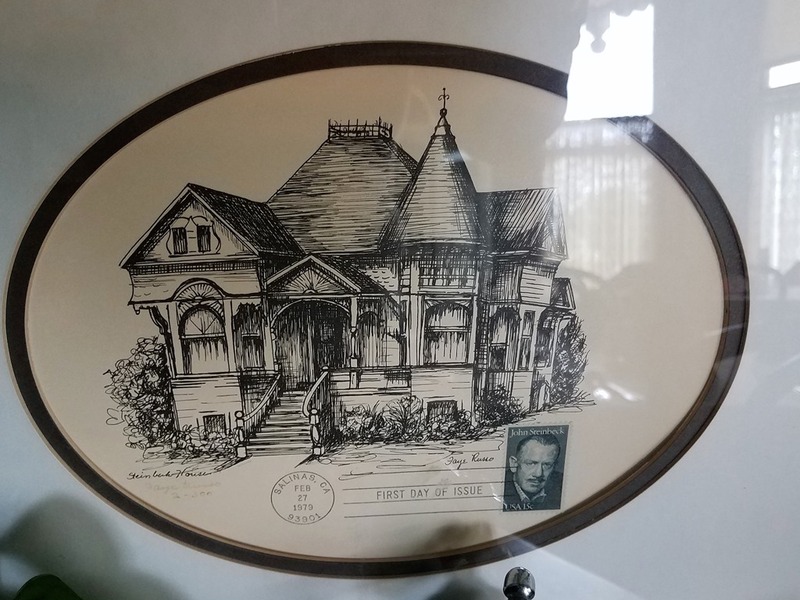 It is in family pictures, so they know it was the one that was there when Steinbeck was a child. We left and went down to the gift shop in the basement. 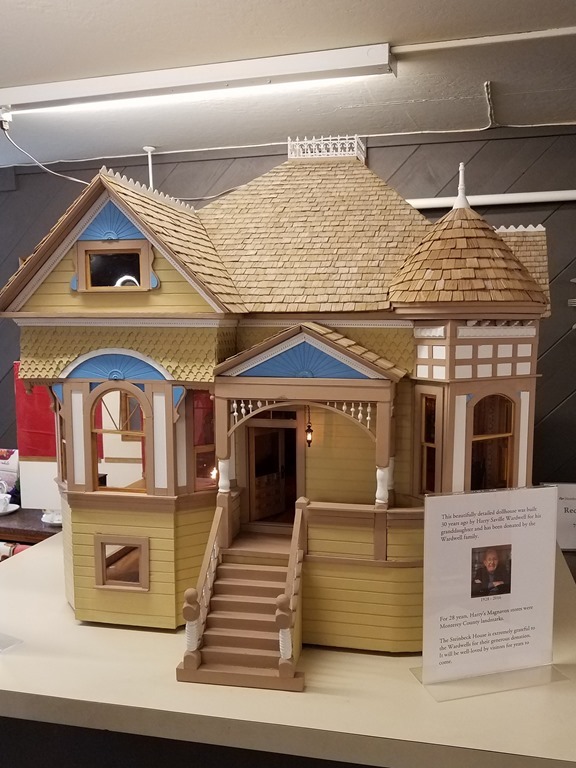 A man in town decided to make this doll house for his daughter. He built it to scale. 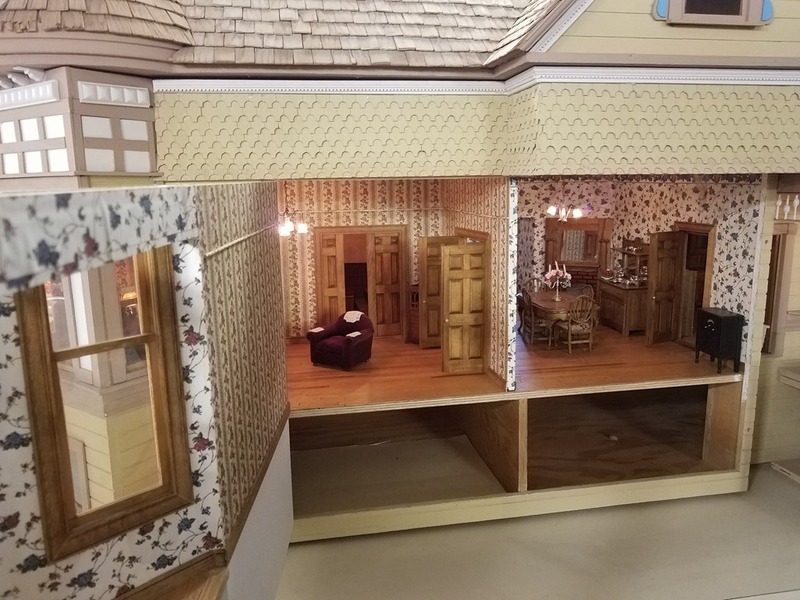 It took 17 years, and by that time his daughter was no longer interested in the doll house. She had graduated from college! The detail was incredible! The doll house was very interesting! The ladies in the gift shop were so nice that I felt guilty for not purchasing anything. We stopped for gas, 3.69 a gal. and returned to the MH. We decided to go out to dinner, so we ran and picked up Bob’s prescription. The gal wanted to give give him 25 lancets. Bob still follows his blood sugars. He explained to the gal that he gets 90 days worth. He had to argue with her about the number supplied. The prescription shows 90 days worth! She finally got them, then put them in the rack, knowing full well he was standing there waiting. He was not happy…. We went to dinner at a little seafood deli/restaurant. It was expensive, but everywhere in California seem to be pricy. I had the broiled scallops. Bob had the clams and chips. Both were excellent. Sunday- We drove to Monterey. 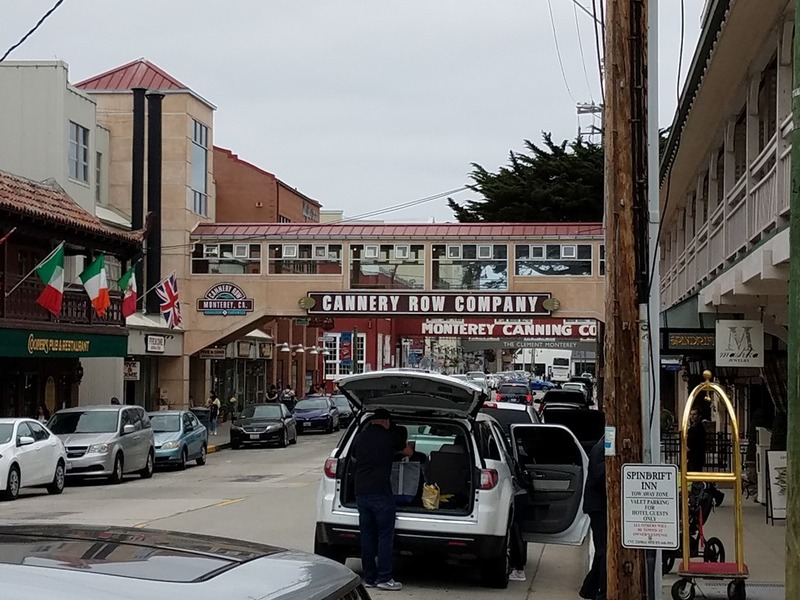 Our first stop was at Cannery Row. Because we were early, we easily found a parking place at a meter. The above monument pays tribute to the diverse people of the area. 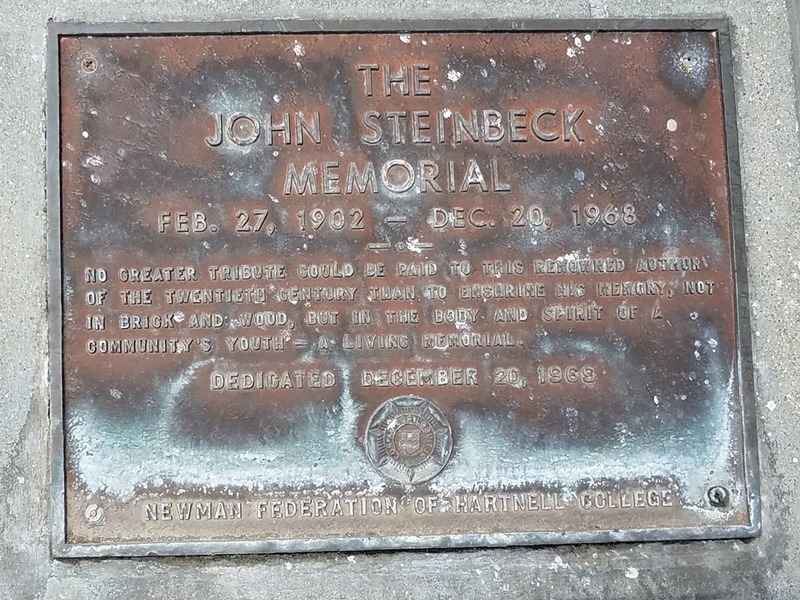 On the top is John Steinbeck due to his book Cannery Row. 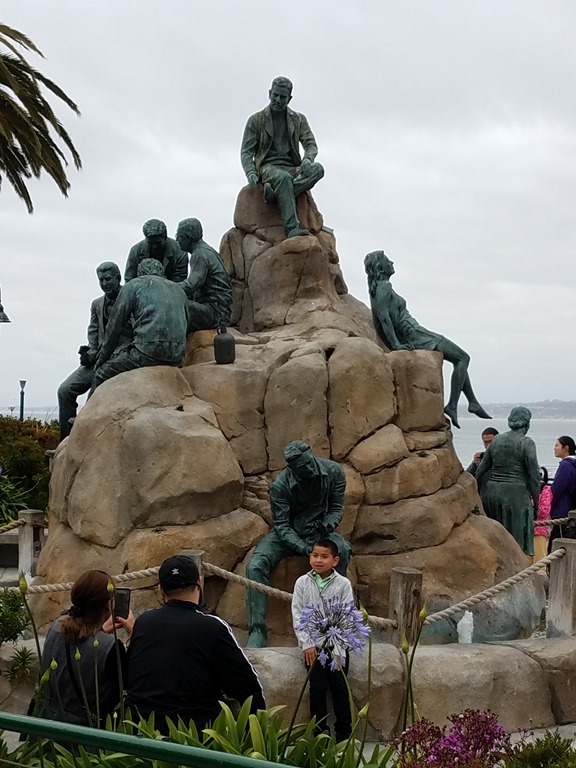 Eight other figures surround the monument, representing the bustling sardine canning days and other folks. 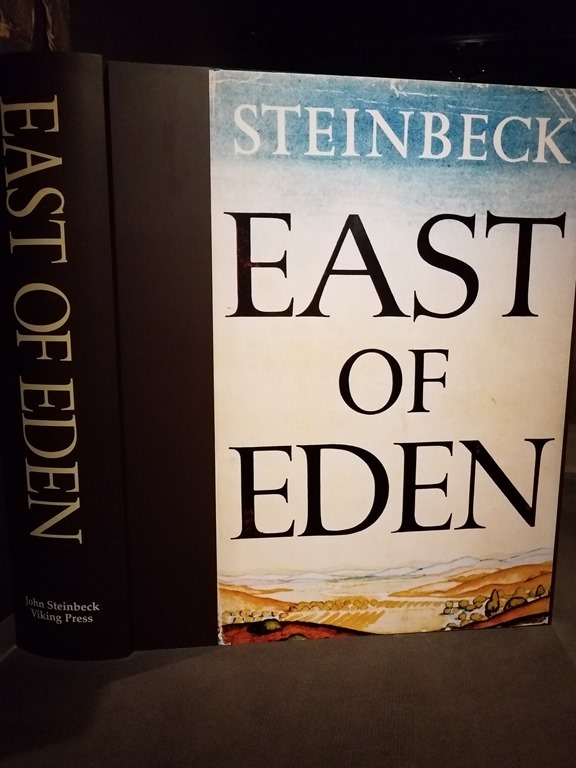 Steinbeck’s friend, Ed Ricketts, who is one of the ‘fathers of marine biology’, a Chinese person who represents the Chinese fishing village, and two female figures “Madam Flora Woods” who was know for her generosity and one of her girls. Four boys sit together to represent the entrepreneurs who worked on the rebirth of the area. 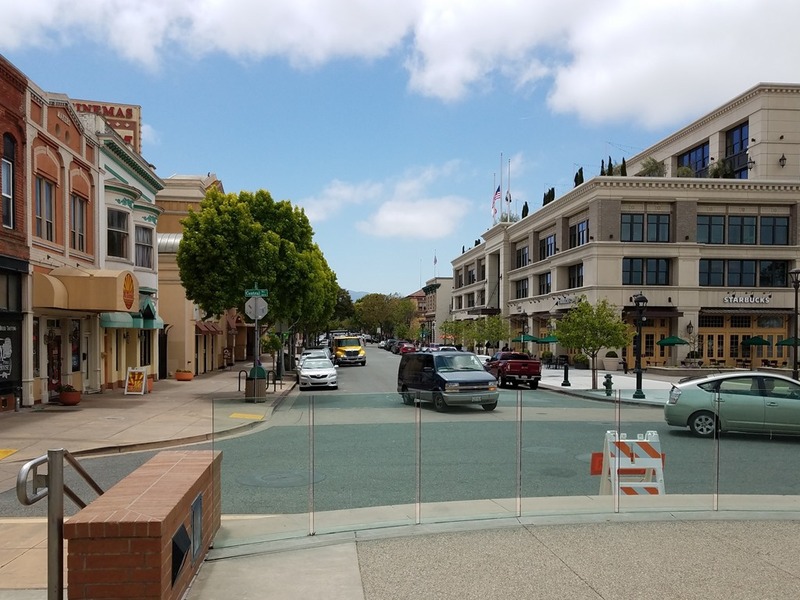 Cannery Row, which has so much history, has been turned into a shopping mecca. Mainly, tourist stuff. We walked the length. At the end is the Aquarium. We stopped at the Toll House Cookie store and purchased two cookies for later today. We also stopped in at the Ghirardelli Chocolate store. We had a coupon. We purchased 2 pieces of chocolate each. 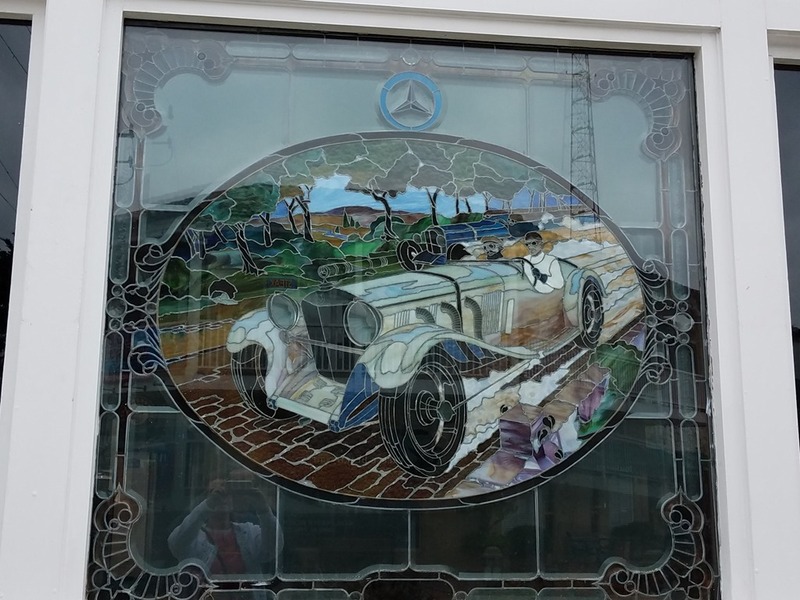 I really liked this stained glass on a restaurant window. We drove south on Rt. 1. Our destination was Big Sur. 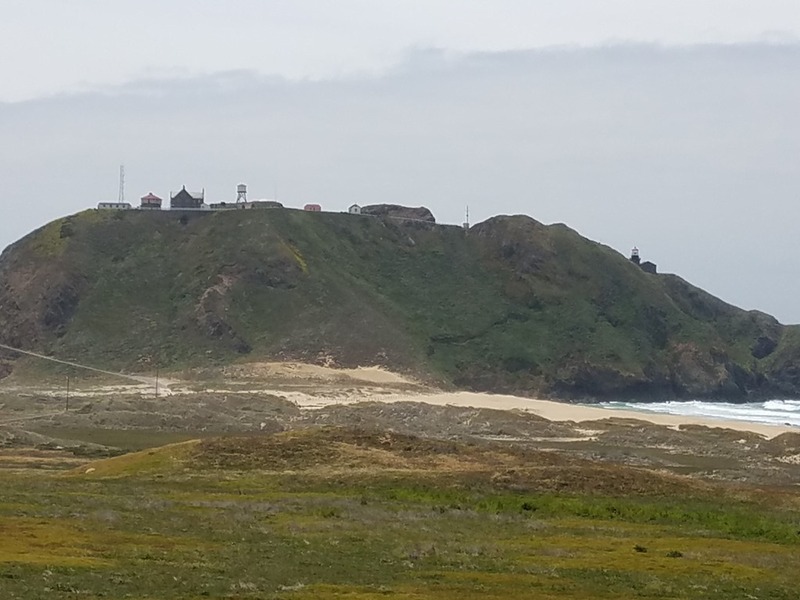 South of Big Sur and north of San Simeon, Rt.1 is closed for repairs. Since it was Sunday, there was a lot of traffic. This is Big Sur. We crossed over the famous Bixby Bridge 714 ft. long and 260 foot high wonder of engineering built in 1932.There was so much traffic and no place to park, so we did not get a picture. We stopped at Safeway on the way back. 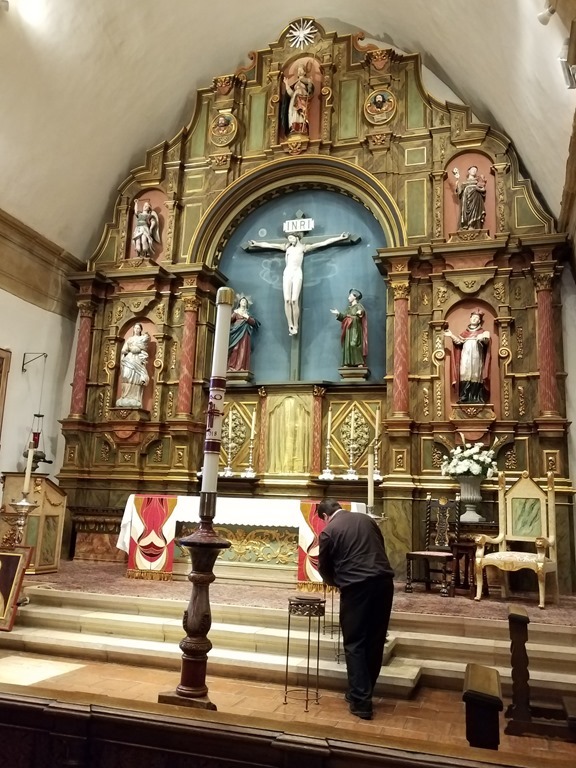 Then we went to the Carmel Mission. 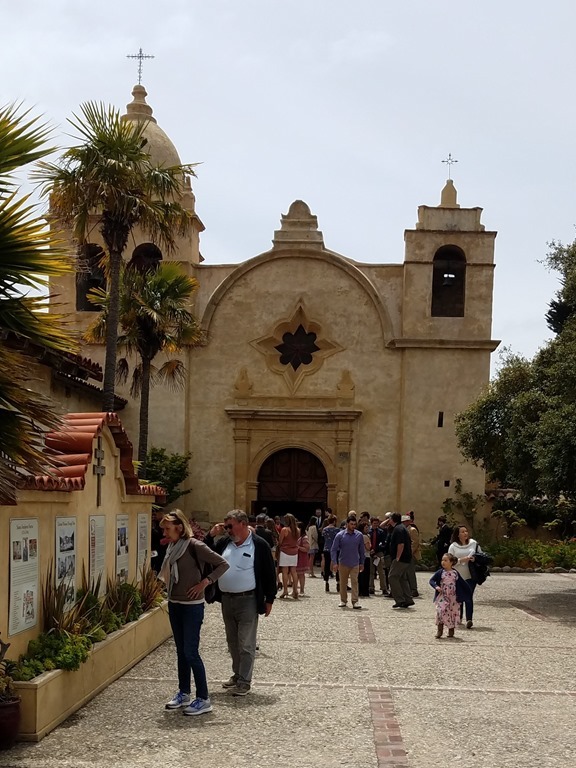 The Basilica of Mission San Carlos Borromeo, Del Rio Carmelo Carmelo-By-The-Sea. Wow, is that a mouthful! 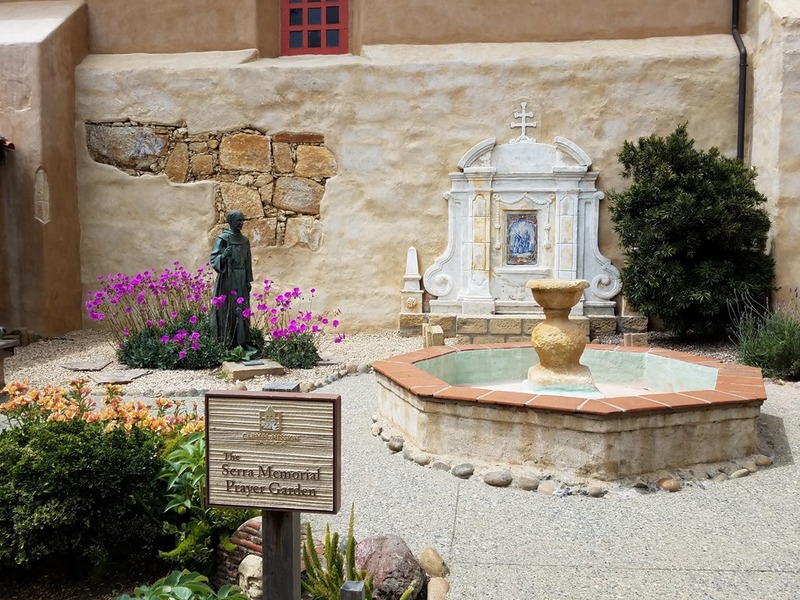 The mission was founded June 3, 1770.,by of course, Padre Junipero Serra. It was the second mission. The Padre was born in Petra, Isla del Mallorca on 11/24/1713. 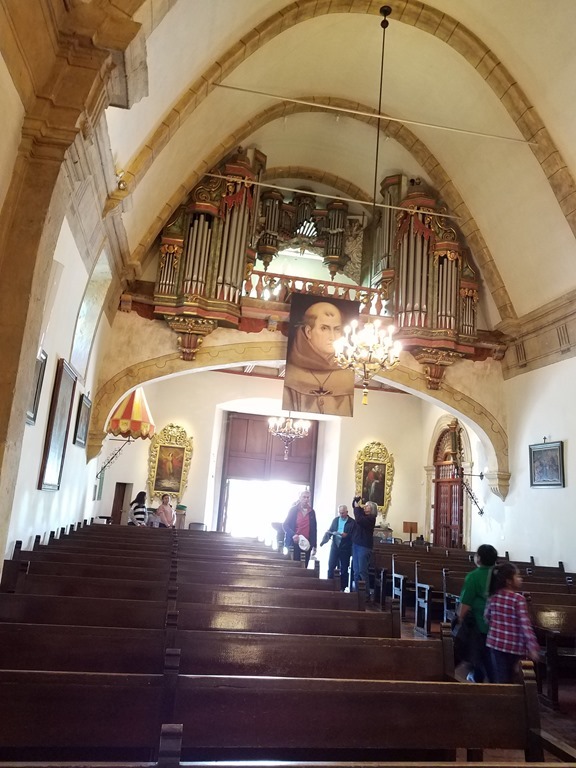 He was named the Presidente of the Missions of Lower and Upper California in 1767. He walked from lower California(Mexico) to San Diego where he established his first mission in 1769. Then he came by boat to Monterey. 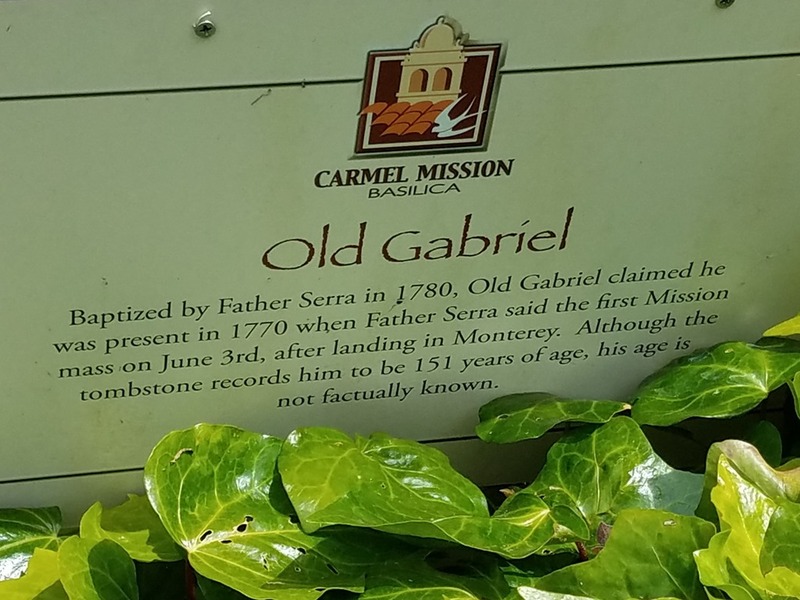 He originally founded the mission in Monterey, but moved it to Carmel, as there were more Native Americans in the Carmel area. Over 4000 were baptized between 1770 to 1836. 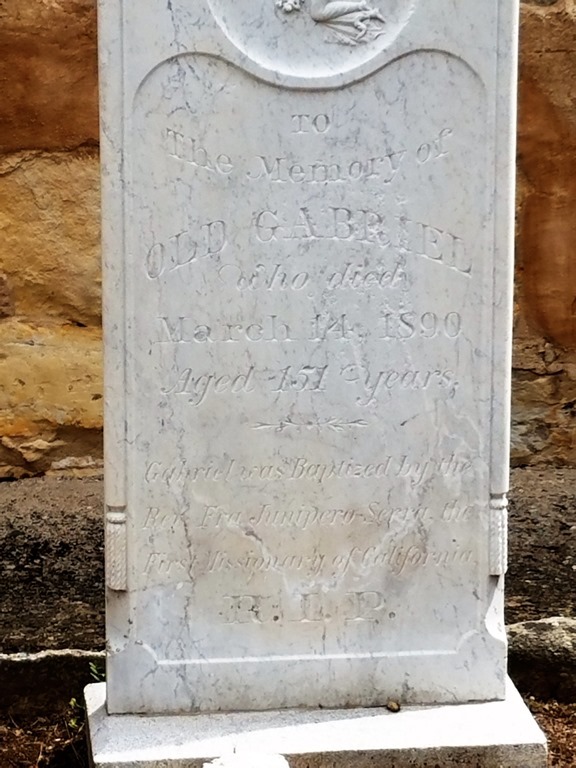 He died August 28, 1784 and requested to be buried in the sanctuary of the Basilica.The present church was built of native limestone in 1793. The building fell into disrepair as the area changed over the years. Eventually, in 1924 they started to renovated the buildings. In 1961 the Basilica was designated a Minor Basilica by Pope John XXIII. In 1985 Pope John Paul II declared Serra venerable and in 1988 he was beatified in recognition of his heroic virtues. 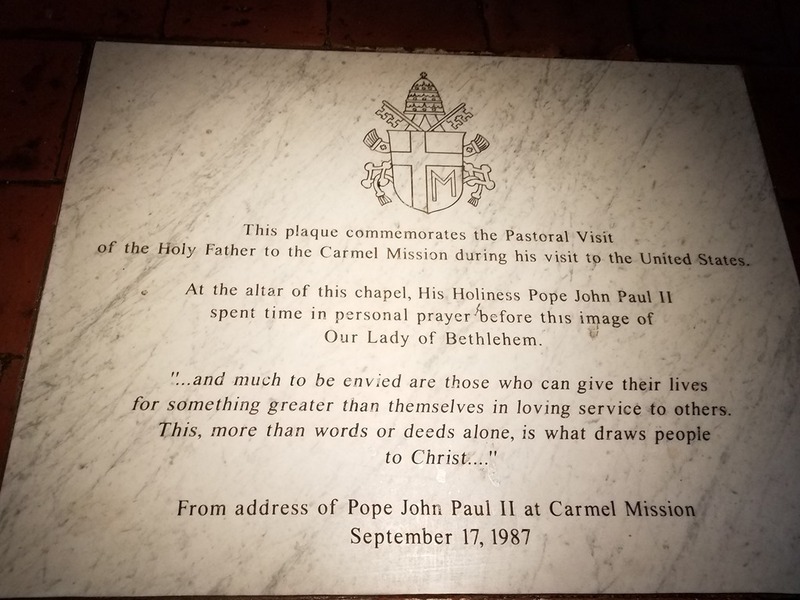 In September 1987 the Pope visited the mission as part of his tour of the US. Pope Francis canonized Saint Junipero Serra on September 23, 2015. ( To become a saint you have to have a documented miracle. 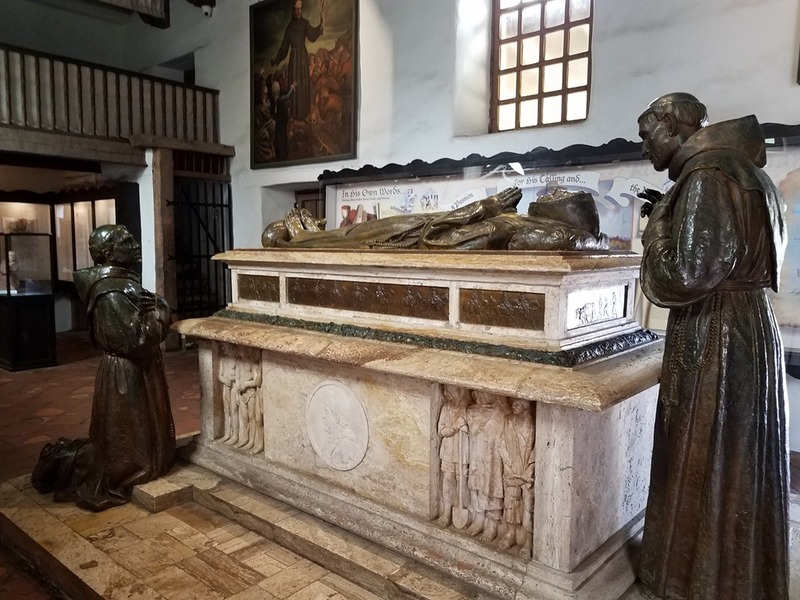 In Serra’s case, a woman who had Lupus prayed to Serra and was cured). Whatever the story, the Padre was the real deal. 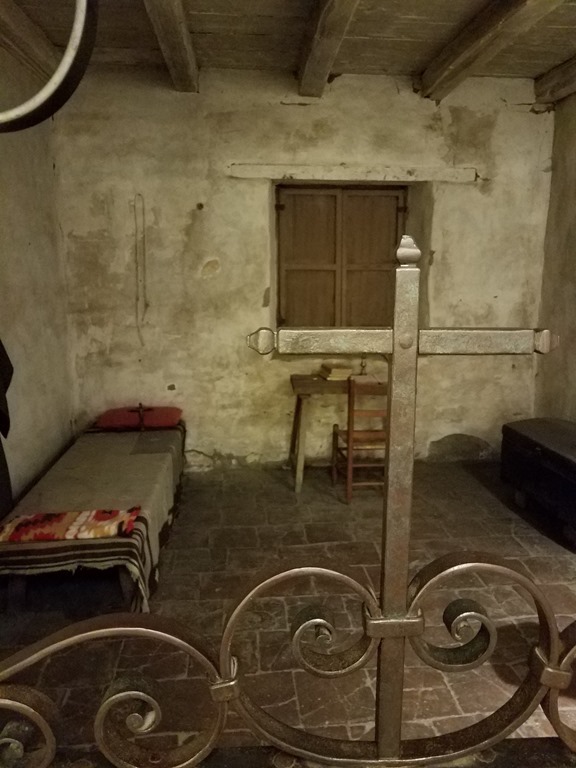 He lived as a Franciscan, in a small room with no ornamentation. He brought a lot of items with him to the area. Mass had just ended when we arrived. We purposely scheduled our visit this way. The bell tower is unique as it has 9 bells. Below, to the left on the floor, the white square is the memorial of where Serra is buried. 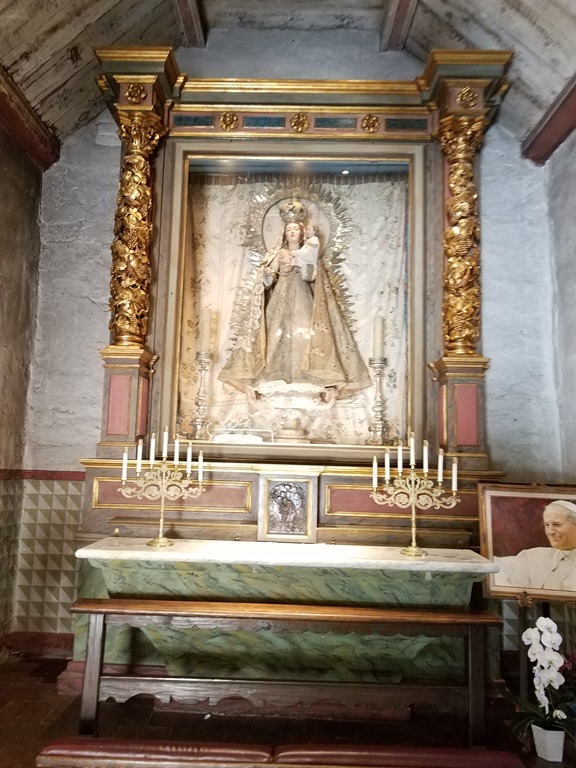 Below is the Our Lady of Bethlehem. This is not a picture. 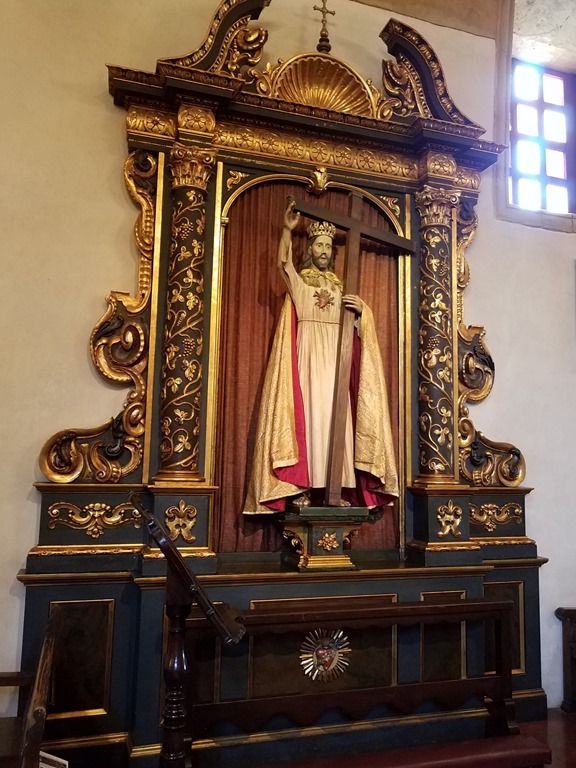 It is a large doll, brought to the mission by Padre Serra. It fascinated me. It was awe inspiring! Eagle eye Bob spotted this. It is hard to read, as when I try to highlight it goes back to normal. Can you see the issue?? Yup, it says that this person lived to be 151 years old. We stopped in the little museum and watched the film. 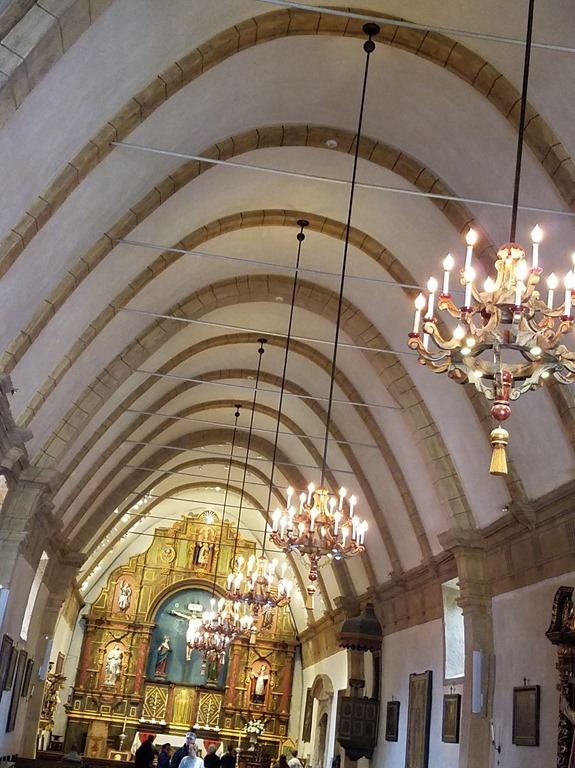 Notice the arched ceiling in the church. It is unique to this era. 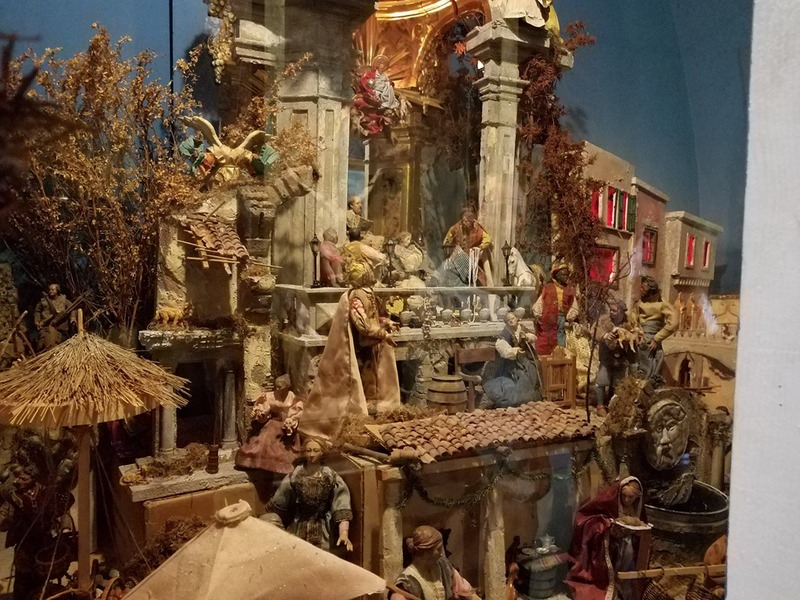 This ornate Nativity scene was in one of the back rooms. 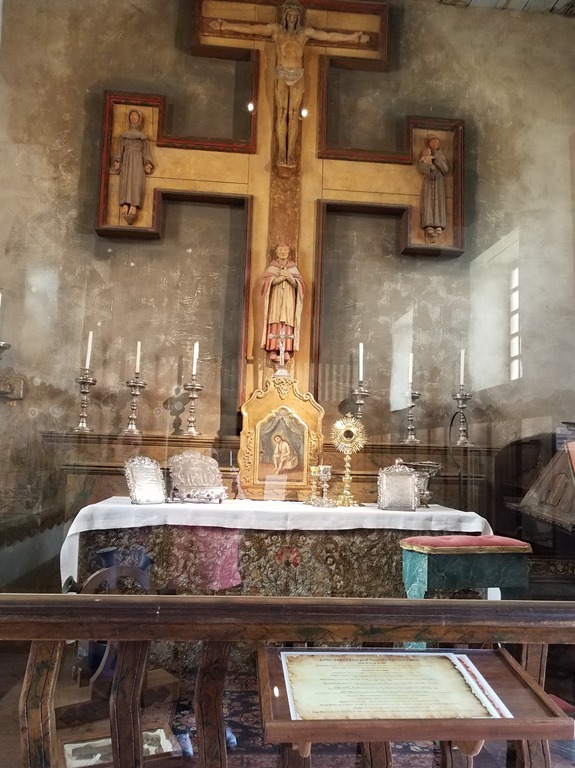 This is another small chapel in the Basilica. The Padre’s Office. 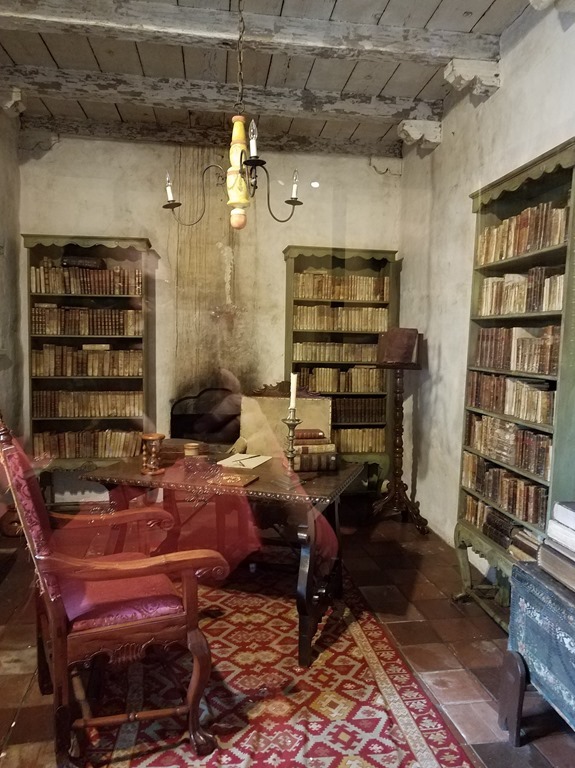 The Mission hosted the first Library in California. 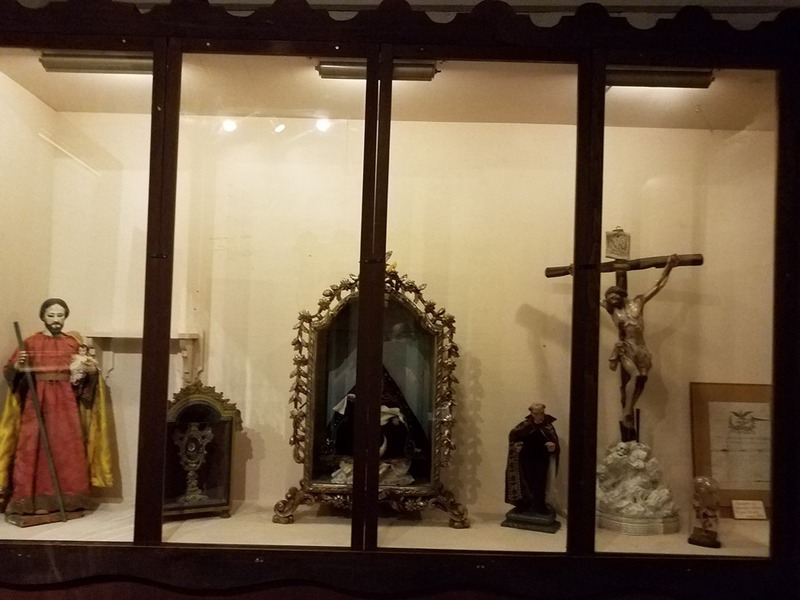 Above, more relics that Padre Serra brought to CA. Below is his room. We left and returned to Salinas. No traffic back up on the road today! We had a quiet evening at home. Monday- Moving day. We never saw the Camp Host at this Elks Lodge in the entire time we were here! We drove north on the 101 past more vegetable fields. 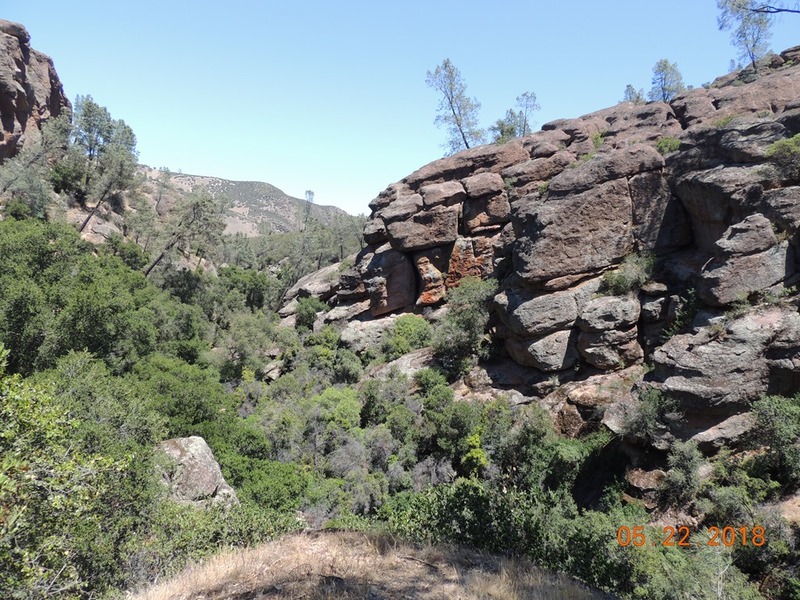 We exited onto Hwy 156 east and traveled to Hollister, where we turned south on Hwy 25. Now we were seeing cattle ranches and a few vineyards. We only traveled 44 miles to the San Benito TT. It is a typical TT. We found a flat site with 50 amp, FHU. We had to pay $5 extra each day for the 50 amp, but it is worth it to have hot running water. We settled in, ate lunch, I started a load of laundry, and we then drove back to Paicines. The town consists of a General Store/Café and Post Office. We picked up our mail and returned to the MH. On the way back in, we drove around the RV park, as it is very large. They have over 500 sites and the sites are not that close together. We continued to settle in. I continued to do laundry and Bob took the sheets and towels to the laundry here at the park. It was fairly inexpensive, at $1.25 to wash and $1 to dry. That is the least that we have seen for awhile! We had a quiet afternoon. Tuesday- At around 10:45, we left and drove 23 miles south on Rt. 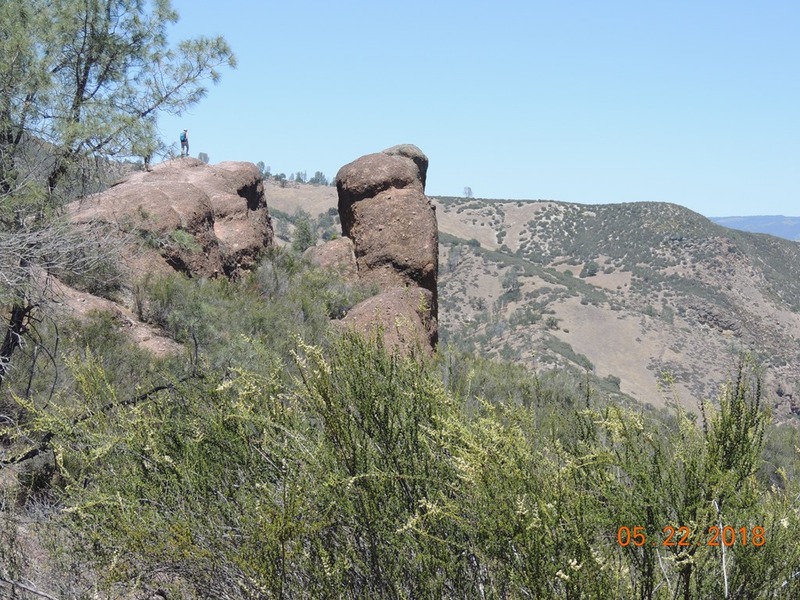 25 to Pinnacles National Park. I had tried to look up the park in our Fodor’s National Parks of the West book, and it was not in there. 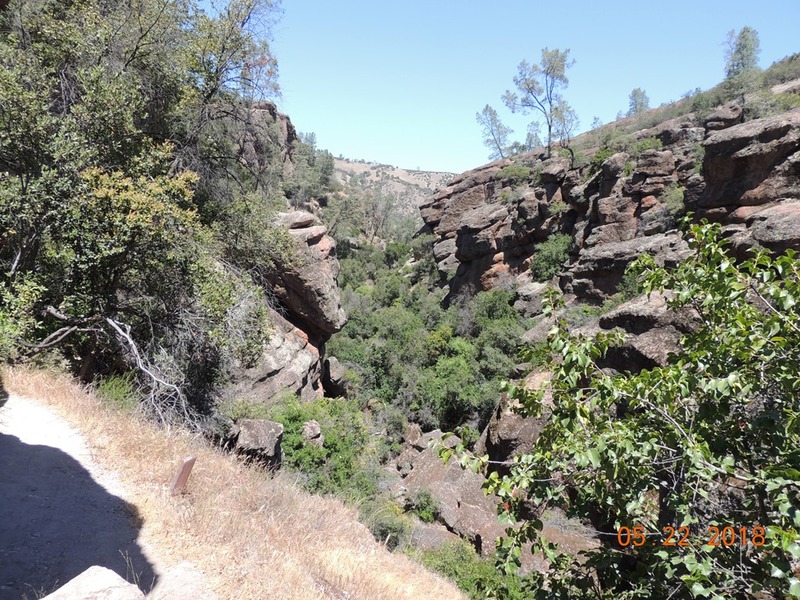 When I Googled the park, I found that it had been designated a National Park in 2013. Our book’s copyright is 2009. Before that the park had been a National Monument. We stopped at the Visitor Center and I stamped our National Park book. We received the map of the park and proceeded to the Bear Gulch ranger station. There was a nice picnic table in the shade, so we ate our picnic lunch. There is no restaurant or many facilities. Surprisingly, there is a campground with 30/50 amp electric and a swimming pool. 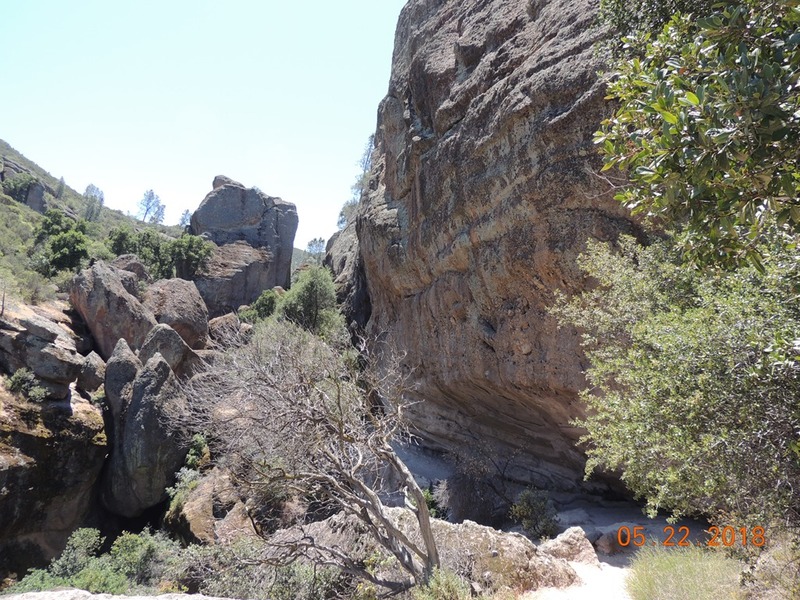 When I asked about it, the Ranger said that the RV park had been privately owned and that the owners sold the park to the NPS, along with the land, which has now extended the park. Also, they had running water in the restrooms. Usually most NP restrooms are vault toilets. That was a happy surprise! 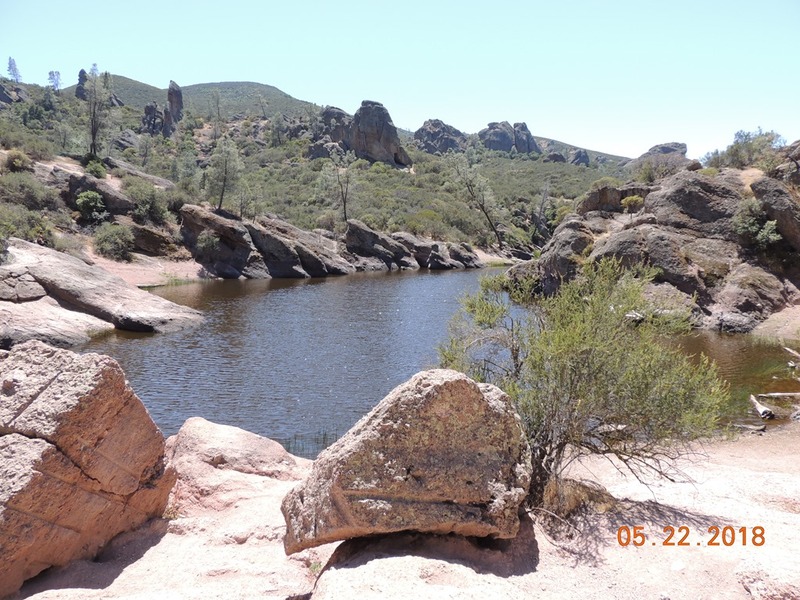 Although, the Ranger also said that the septic system had failed at the campground, so they were bringing in port-a-potties for the Memorial Day weekend. 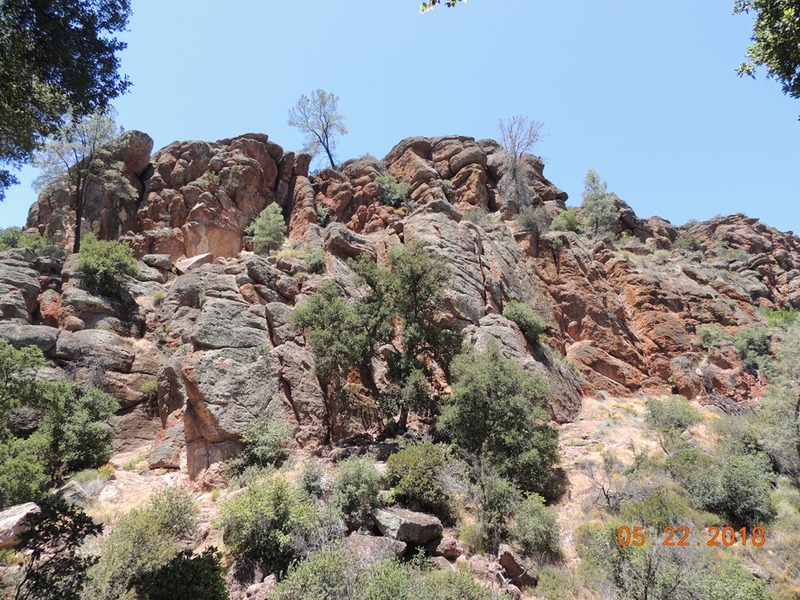 We watched the movie and talked with the Rangers about the hikes. 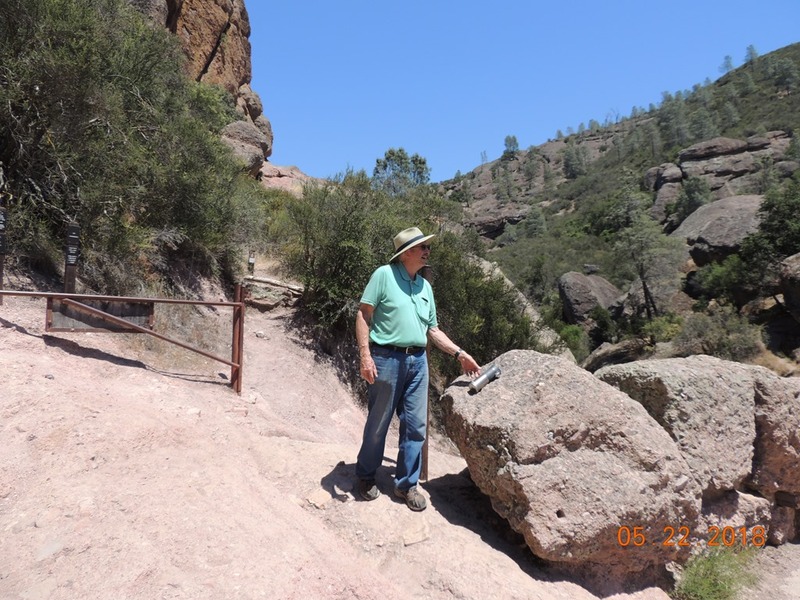 The ladies said that there was a moderate hike to the Bear Gulch Reservoir. In looking at the map and at the signs, it was only 0,7 miles to the reservoir. The gals suggested we take the left fork up and the right fork down. They lied! It was 1.2 miles uphill. Bob’s Fitbit told us we had climbed the equivalent of 3800 flights of stairs. Whew, it was a trip. 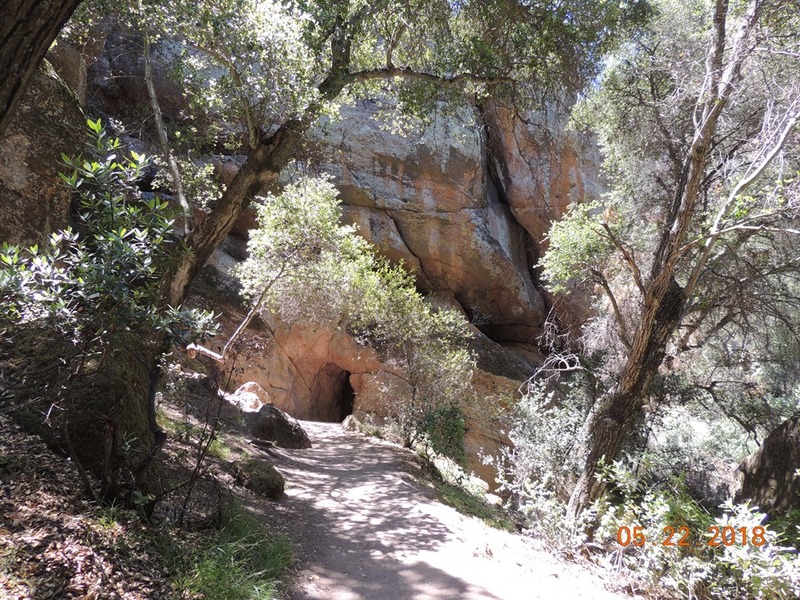 Lots of rocks, tunnels etc.to climb through. I had to be very careful of my bad ankle. 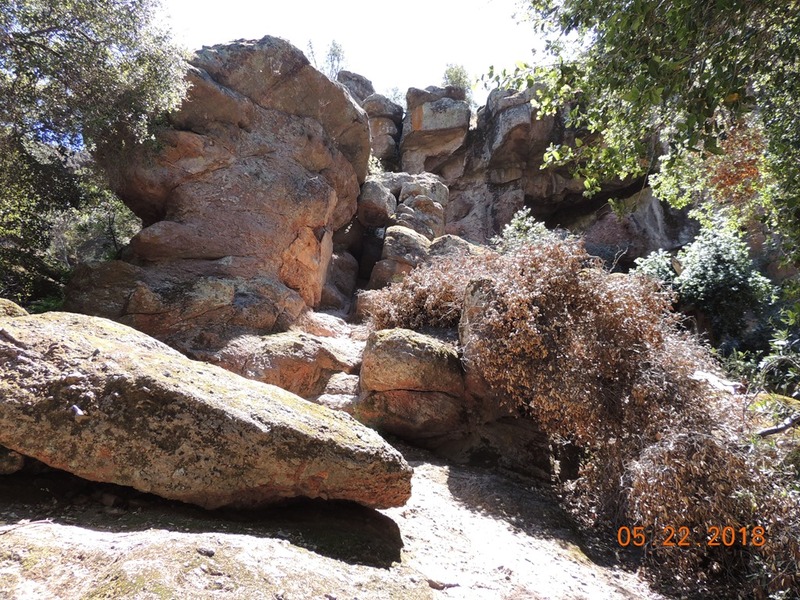 This was the trail through the rocks. 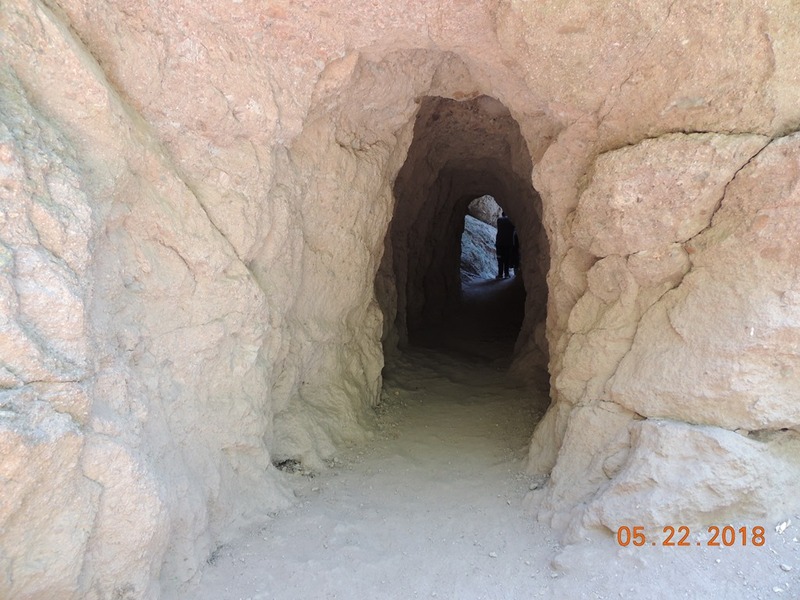 Below was one of the tunnels. 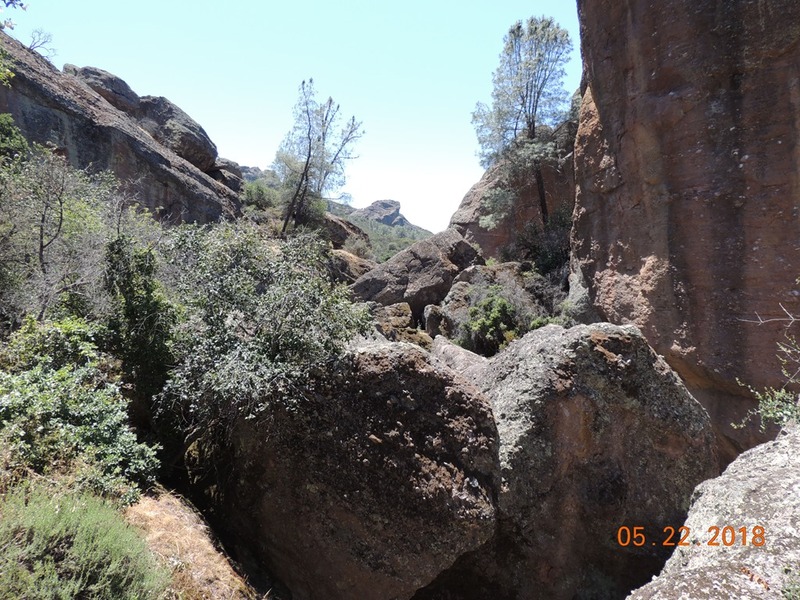 Above, we literally had to walk under this rock above. When we exited one of the tunnels, we ran into these climbers. They were just reaching the top of the rock. Right before the reservoir, there were small steps in the rocks. There was a metal railing to the left, but the steps were very narrow. There were about 70 steps. Then we finally reached the reservoir. .
Now we started the 1.2 miles back down the mountain. 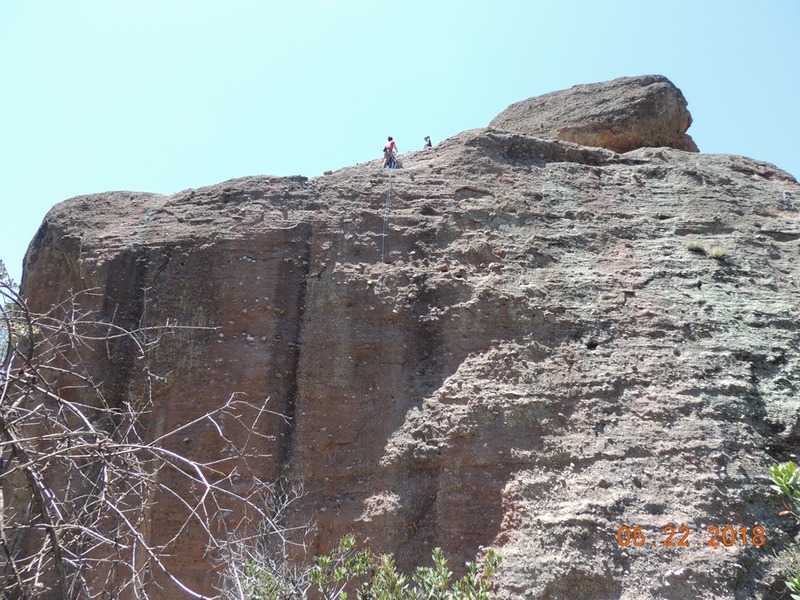 Below are the pinnacles. It was very pretty, but been there done, that! Fortunately, no injury to my ankle. 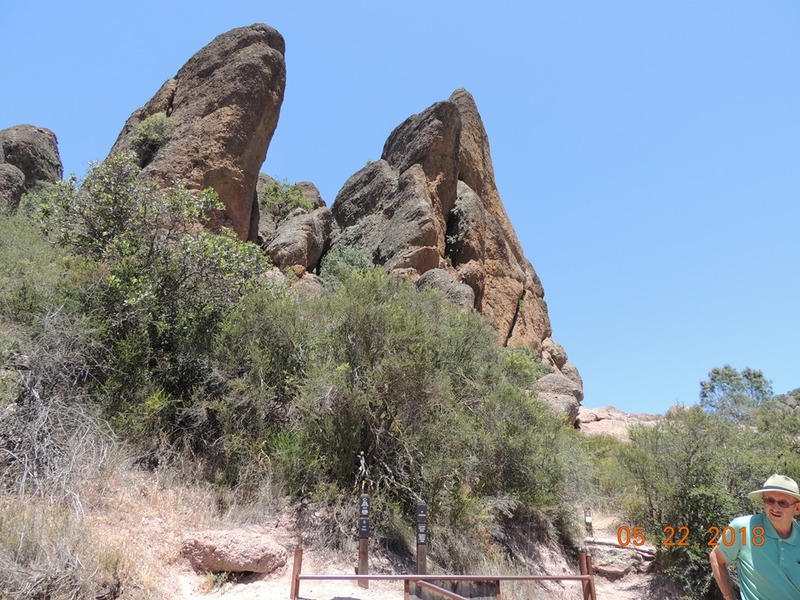 We arrived back at the car and drove to the end of the road to visit Old Pinnacles. It was just a parking lot for the trails, so we returned to the MH. We had a quiet evening at home. Wednesday- We are having a quiet day at home. I worked on the blog and Bob did some tasks. Then we washed the poor car. It was filthy as there had been a slight rain in Salinas, which combined with being towed behind the MH made the car filthy! So Bob cleaned the outside and I did some of the inside. The weather is perfect with a slight breeze and the temp in the 70’s with bright blue skies. We went to the Camp Store which is open Wed to Sat. Then we went to the Family Center and did a book exchange. We grilled a steak and had a quiet evening at home. Thursday- Another quiet day for us. We did basically nothing, a little laundry and relaxing! Friday- Moving day again, and of course, it rained. So much for the clean car!. We traveled back north through Hollister, turning onto Rt. 156 to 152. We traveled through more citrus orchards and what looked like vineyards, but they were actually growing raisins.This freeway took us past the San Luis Reservoir, which was down about 30 ft.. We went through the pass in the Diablo Range. There was a lot of traffic, especially trucks! We continued east to Rt. 99 and turned south to Fresno. At this point we had entered the San Joaquin Valley. Now we were traveling through raisin, almond, and pistachio orchards. We drove into the Fresno Elks Lodge. Bob went into the Lodge to sign in. We had a reservation. Again, we never saw the Camp Host while we were here, even though we were parked next to him! The guy in the Lodge was not real friendly either. We ran to a car wash, $7, and washed the dirty car, again. We settled in and decided to go to dinner at the Lodge. We always try to support the Lodges when we use their Rv parks. Well, this was an experience! The dinner started at 6:30, or so we were told! The sign said $10. We paid $20 each. Bob had the steak and I had the steak and scampi. They included stale bread, a salad, and the meal. 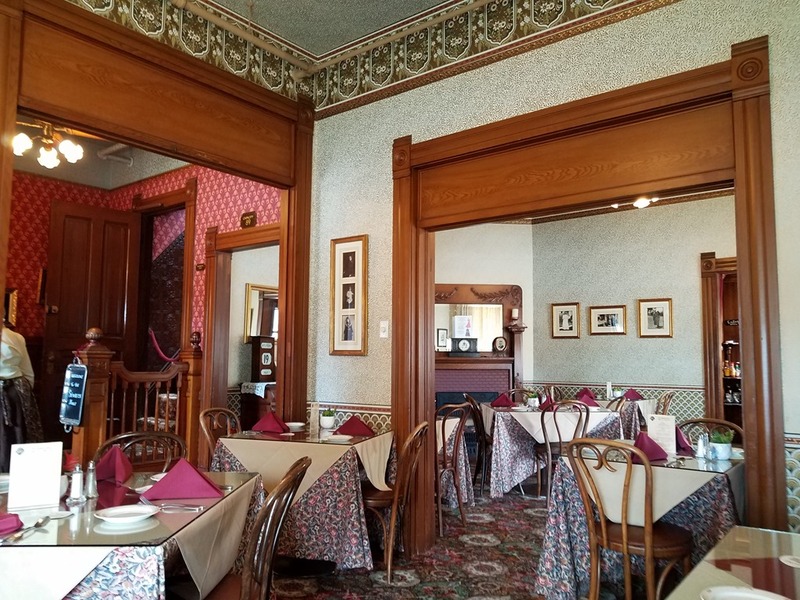 We waited 45 minutes to be served, and there were only 20 people there.We should have taken a clue from the fact that the place was not crowded. What a mistake! We could have gone to Texas Roadhouse, had a much better steak, better service, and the awesome rolls!